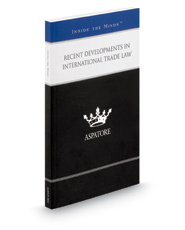 Recent Developments in International Trade Law provides an authoritative, insider's perspective on the varying laws affecting trade outside of the United States. Partners and chairs from some of the nation's leading law firms examine recent legislative and enforcement trends and how they can impact companies. These top lawyers discuss the latest developments regarding the World Trade Organization, the potential impact of exclusion orders, and the potential complexities of export compliance. Additionally, these leaders analyze the legal and cultural differences between countries and present ways for lawyers to address them. The different niches represented and the breadth of perspectives presented enable readers to get inside some of the great legal minds of today, as these experienced lawyers offer up their thoughts around the keys to success within this ever-changing field.